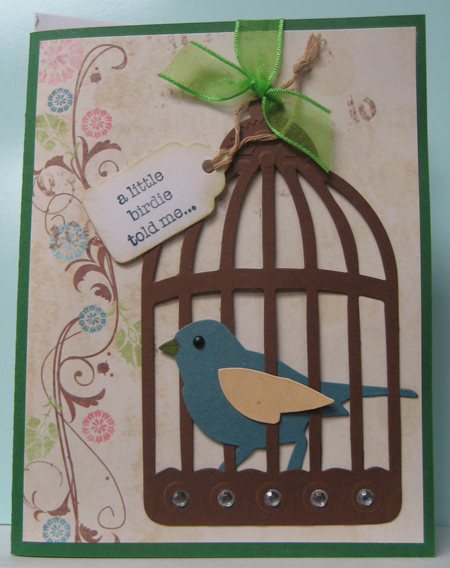 Little birdie cards are so versatile because they can be used for so many occasions!! For our first card for cardmaking this time I decided we would make some!! I choose decorative paper which had a decorative element on the left hand side and we positioned our little birds with their cages to the right of them. This used some scrapbook paper which has been languishing in my stash because some of the papers were made for specialty layouts and had decorative elements that were not uniform. A few more pages cut up and out of the bin!! Started by adhering the decorative paper to the coordinating card fronts. 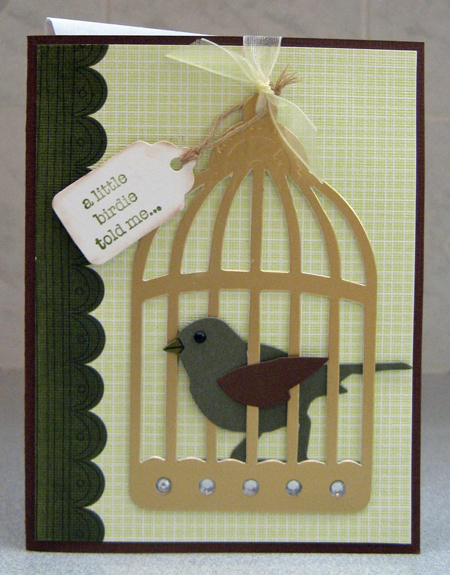 Next, I cut the cages (TH SX) out of coordinating cardstock, trimmed off the finial and manually embossed the top with a round element from a gear embossing folder. I die cut the birds and then the wings a different colour. I started with the bird - created a beak with a marker and added a tiny black brad to create its eye. I did not want mine behind the cage so I positioned it so it had its head sticking between the bars of the cage and glued the lower branch to the back of the cage. I added the wing next using a little double sided tape. Next, I added the hanging ribbon through the hole at the top, secured it with tape and slid on the little birdie tag before mounting this large element to my card front using white glue applied with a fine tip applicator. The little tags were cut with a tag die (SX), stamped with a little stamp from a birdie set (SU) using a stamping jig and then had a little string tied on. Next, I wrapped the ribbon to the inside of the card and secured it with double sided tape and tied the off cut to the front with a single knot to simulate a bow. To finish off my card I glued rhinestones inside the holes at the bottom of the cage with white glue and secured my tag with 3D foam tape. In the end, I added a bit of chalk to the tag to soften its edges. Some of the girls did not secure the bird cage to the card which left it swinging which was also a nice effect. It could then easily be removed and hung in a window or reused.